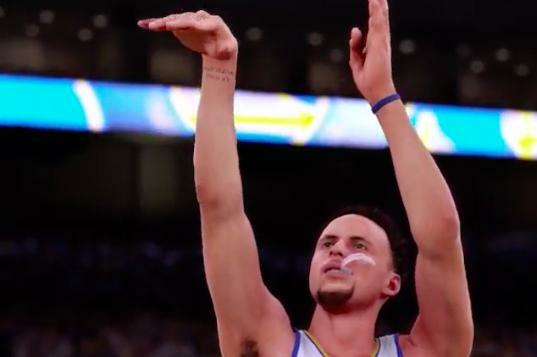 Steph Curry nails a shot while chewing his mouthguard – in the NBA 2K16 video game. Soon he will be doing it again in real life. So today Our Golden State Warriors begin their defense of the NBA Championship. It still feels weird to say that. Maybe it’ll finally sink in for real tonight when they hand out the rings and raise the banner into the rafters. The Dubs will be kicking off the season without Steve Kerr, who is still out with complications from offseason back surgery. I assume, though, that he will be there to get his ring – as will Alvin Gentry, last year’s top assistant, who is now the head coach of the New Orleans Pelicans. And if the Pelicans are in town, that means Anthony Davis, a/k/a The Brow, consensus future MVP, will be there too. Davis and the Pels will have something to prove after being swept in the first round of last year’s playoffs, and the Warriors will want to respond. But we all kind of like The Brow, and we like Gentry, so this will not be a grudge match. Those will come soon enough when the W’s play the Rockets (10/30), the Grizzlies (11/2), and – yes, Lord, let it be so – the Clippers on Wednesday 11/4. The Clippers did a lot of yapping this summer, and are feeling all swoll about themselves after stealing DeAndre Jordan back from Dallas and adding a couple of decent bench players. But to me they’re still basically the same bunch of floptastic crybabies that we smacked down repeatedly last year, and I look forward to that matchup with great relish. So let’s go, let’s go…how long till tipoff? This entry was posted	on Tuesday, October 27th, 2015 at 3:48 pm	and is filed under Golden (State) Years. You can follow any responses to this entry through the RSS 2.0 feed. You can leave a response, or trackback from your own site. All in the same night, your beloved Warriors win their 1st regular season game for this year & my beloved KC Royals beat the Mets in 14 innings of the World Series Game 1. I understand it was the longest World Series game ever. Tonite, for Game 2, we beat the Republican debate! Great game. So rewarding that they are THE TEAM. Love it, them, and you. Luke Walton is a genius!